Mbizo Chirasha was born in 1978 in Zvishavane District in Zimbabwe, and was inspired by his social surroundings at a young age. 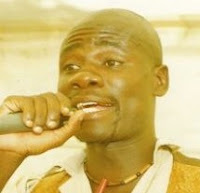 As a young man, Mbizo quickly gained prominence as a performing poet and writer both in Zimbabwe and internationally. His works are published regionally and around the world. He has turned to a career as a consultant/creative writing facilitator and arts entrepreneur. He is, amongst other things, the founder of the annual "This is Africa Poetry Night" and the founding director of the Young Writers Caravan of Zimbabwe. 1. Can you tell us a bit about the reaction to Obama's victory in Zimbabwe? Obama is a remnant with African roots. His election makes all minded Africans happy, including Zimbabweans. 2. Is there a sense in Zimbabwe that Obama's election will lead to a change in American policy towards Zimbabwe? There's been no change to Zimbabwe at all. He endorses sanctions like the Bush administration, which ruffles feathers here. 3. More generally, what do you think Obama's victory does for the hopes of Africans? Nothing of impact to Zimbabweans, though there was euphoria here when he came to power. It was supposed to big in in Kenya, Zimbabwe and other countries, and it was. 4. This excerpt is from a poem three to four times longer. What is the average length of your poems? Are you drawn to one length over another? Different lengths for different purposes? My length depend on the messages I hope to send to society. This poem is a dedication, which generally is a longer form for me. 5. Do you have any new projects or poems that you are working on that you think our readers might be interested in? I am guest lecturing in colleges on creative writing, poetry and literature. I am hoping to restart the African Poetry Chatroom, but the bad economy has been preventing it. Mbizo you have a vision. May people come to your aid. May the supernatural spirit help you so. hello darko, this is mbizo chirasha , how is things , hope you are okay ,thank for the comment you gave to my poem , on lthe last issue, i like your blog , it needs more building and design. , how is england , hope you are writing every day . Dear Mbizo. Everything is somehow okay, after taking a holiday in an English countyside. I've noted your suggestions. Thanks.